"Infinite Possibilities (Part 2): Icarus Abides" / "Infinite Possibilities (Part 1): Daedalus Demands"
"Infinite Possibilities (Part 2): Icarus Abides"
"Infinite Possibilities (Part 1): Daedalus Demands"
Farscape is a heavily serialized show, but its continuity tends to only flow in one direction. Our heroes endure the most insane, absurd experiences, and they carry forward all the damage and trauma that comes with such survival. John Crichton’s experiences in the Aurora Chair stand as the clearest example of this; the introduction of Harvey merely literalized a madness that had been present from “Bone To Be Wild” onward. The characters are given room to grow: D’Argo mellows out, Chiana grows more trusting, Aeryn Sun just generally soars, and Crais becomes… something. Tiny backstory seedlings are allowed to grow into entire plotlines, as D’Argo found his son, Aeryn reunited with her mother, and Rygel got to confront his torturer Durka; these weren’t ultimately happy reunions, perhaps, but much of the tension, particularly in D’Argo case, came from the characters’ inability to recognize how much time had changed them. That’s perhaps the most striking tool in Farscape’s long-form storytelling arsenal. No encounter between characters ever unfolds quite the same way twice, if only because the characters are always painfully aware of their past mistakes. (This is Farscape we’re talking about, so there are always past mistakes.) Context is not a myth, and characters’ personalities, even their most deeply held beliefs, can never be entirely separated by the particular pressures of their latest predicament. The show hasn’t left a lot of room for return appearances by guest characters, but there’s a general pattern to those we have seen so far. Every big reprise reminds us how far the shipmates have progressed since they first met those characters; this took on a heartbreaking dimension with Gilina Raez in “Nerve”/“The Hidden Memory,” whereas the show had enormous fun in “Liars, Guns, And Money” with showing how some of the crew’s most dangerous first season adversaries could now be bought off as allies. “Infinite Possibilities,” two of Farscape’s finest hours, doesn’t quite fit that mold. Crichton and company reunite with Jack the Ancient and Furlow, and these characters are powerful enough to push John back toward something closer to his pre-Scorpius characterization. Indeed, given Jack the Ancient’s ability to remove Harvey once and for all, that’s literally what happens, but the change is apparent even in “Daedalus Demands.” The Crichton of this two-parter isn’t quite the relatively straightforward hero of the show’s first year, but he’s damn close. There’s a clarity of purpose to his actions here that there wasn’t in, say, “Self-Inflicted Wounds.” In fact, one might even compare the general murkiness of that two-parter’s plotting with the crystal-clear structure of this story; where once Crichton struggled to understand what the frell was going on, here he knows precisely what he has to do. The question is whether he and his friends are willing to do the terrible deeds that must be done. Even if “Infinite Possibilities” is not the best story that we’ve seen so far—and I could certainly make that argument if so inclined, although my heart forever belongs to “Family Ties” and “Crackers Don’t Matter”—then it is at least the best executed. This story is Farscape as a big action movie, and it accomplishes that stylistic feat without sacrificing any of the show’s intelligence (though I will say the weirdness is somewhat tamped down). Early plans for this story apparently involved more scenes set in space, but the ultimate decision to focus the action almost exclusively on the planet’s surface and inside Furlow’s workshop proves inspired; the episodes arguably gain a greater sense of scale from the battles and chases in the desert than they would from epic space battles. The initial assault on the compound is particularly well done, as Farscape successfully blends the ground combat with Talyn’s valiant but ill-advised intervention. Even the combination of the Charrids and the Scarrans proves an effective bit of world-building—not necessarily Farscape’s strongest suit, at least not compared to its character work—as this second evil alien race allows for a hell of a Rygel subplot and for there to be some plausible way to involve the Scarrans without all our heroes getting instantly killed. The return of Jack the Ancient and Furlow the mechanic makes this two-parter a direct sequel to two pivotal episodes from season one: “Till The Blood Runs Clear” and “A Human Reaction.” The former revealed the full extent of Crichton’s then-nascent obsession with wormholes, showing him to be fully capable of the same kind of selfishness that he lambasted his shipmates for in “DNA Mad Scientist.” Crichton had made plenty of mistakes before “Till The Blood Runs Clear,” but that was the first instance where his selfishness and his short-sightedness really asserted themselves—not coincidentally, those two traits practically define Furlow in her return appearance. “A Human Reaction,” on the other hand, positioned Crichton as the best of humanity, as somebody capable of understanding and empathy to an extent that far exceed his species as a whole. Once again, the show has the perfect embodiment of that virtue in Jack the Ancient, a being that is an infinitely wise, nigh-omnipotent alien on the inside and the spitting image of Crichton’s old-school, all-American dad on the outside. “Infinite Possibilities” isn’t quite so obvious as to set up Jack and Furlow as the proverbial angel and devil on Crichton’s shoulder, but both work on the assumption that Crichton is like them. Jack the Ancient comes to see Crichton as the true hero that the real Jack Crichton once spoke of, whereas Furlow only ever sees a fellow opportunist. The tragedy of “Infinite Possibilities” lies in how completely our heroes misjudge Furlow, in that they fail to recognize that she is who she has always said she is. She never hides the fact that she is motivated solely by money, but our heroes foolishly insist on appealing to her sense of right and wrong; Crichton and Aeryn chose the worst possible day to stop being cynical. But it’s simpler than that, really: Our heroes, even the utterly non-heroic ones like Rygel, prize self-preservation above all, and it just so happens that self-preservation lines up quite neatly with the goal of destroying the wormhole knowledge. “Infinite Possibilities” makes particularly good use of Rygel, showing first how completely willing he is to jeopardize the overall mission to enact his vendetta against the Charrids; it’s hard to fault him too much, given the genocidal past the two species share. Rygel ultimately shines here because Aeryn knows him well enough to take all his raw, unbridled hatred for his species’ arch-enemies and get him to turn it toward something useful. Rygel still tries to desert his friends on multiple occasions, but he is convinced to be ever so slightly more valiant than usual, and much of that is down to the relationship—combative and annoying though it might be—that he and Aeryn have forged over the cycles. Rygel has probably grown the least of Farscape’s main characters, but what growing he has done has been done alongside his shipmates. John and Aeryn don’t share that same sort of relationship with Furlow, and so there’s an unspoken assumption that she’s the same person they met in “Till The Blood Runs Clear.” That’s such a common mistake to make, really—we all struggle to see newly reunited acquaintances as they are now instead of as we knew them then—but it also tracks with how Farscape has handled returning characters before. Gilina Raez, the mercenaries in “Liars, Guns, And Money,” and even Maldis were treated as fundamentally minor players in the characters’ lives, individuals who might still be useful or powerful in specific instances but were fundamentally distractions from the new adventures that our heroes were engaged in. By this reckoning, Furlow can only be the comic relief, a reliably unscrupulous mechanic with an inexplicably Fargo-esque accent and a wonderfully unconcealed attraction to Crichton. She’s a rogue, sure, but she’s a lovable rogue, the kind that John and Aeryn don’t have to take seriously even after she repeatedly suggests to John that they could run off and make a fortune off the wormhole knowledge, even after she fairly obviously sabotages her own booby-traps to allow the Charrids to enter. This is a story where Scorpius—or at least a neural clone of same—can be vanquished once and for, but a damn mechanic gets both a semi-godlike alien and our frelling hero killed. “Infinite Possibilities,” indeed. The Stark and Crais subplot is nicely handled. I appreciate the implication that, for all his untrustworthiness, Crais is still such an effective warrior that you literally have to blind him to knock him out of a battle for very long. He and Stark make an amusingly vitriolic double act, and it’s fascinating to see how much real emotion Stark appears to invest in his lies to the Scarran; it sure sounds like a lot of that hatred is all too real. The business with the Scarran is ultimately a bit of a throwaway, something that could quite easily be cut out without compromising the story as a whole, but that’s not such a bad thing. Those two have earned the occasional superfluous storyline, and Paul Goddard and Lani Tupu do some nice work to hold it all together. Speaking of performances, both Magda Szubanski and Kent McCord step right back into their characters, neither of which we’ve technically seen in two years. (McCord did fly out to Australia in the interim to do “Won’t Get Fooled Again,” but that was yet another version of Jack Crichton that wasn’t the Jack Crichton. Ancient Jack is the closest we’ve come to the real McCoy since “Premiere.”) Szubanski amps up everything that was fun about her performance the first time around, adding just the right hint of menace to her more comedic traits, and that combination proves deadly. And, I’ve said it before and I’ll say it again, few actors are as capable of projecting old-school American decency like Kent McCord. He was on Adam-12, for frell’s sake. It’s kind of a crazy thing to say, but Talyn finally won me over as a heroic character with his big dramatic rescue of his endangered comrades. It’s amazing how much this show gets you to invest in the emotional development of a spaceship. When I think about “Infinite Possibilities,” I can’t help but be reminded of—and yes, this is pretty damn random—a line from the Time Chasers episode of Mystery Science Theater 3000. The movie in question, both a deeply convoluted time travel caper and the greatest advertisement for Castleton State College ever made, climaxes with the hero and the villain dying grim, pointless deaths, but the presence of the hero’s paradox-created past self means that the character effectively survives. As Tom Servo caustically observes, “He’s dead, but don’t worry: They have a spare!” The ultimate success of “Icarus Abides” rests on whether the episode can get the audience to forget that, even if this John Crichton should die, there’s still another one out there. The death that concludes this story has to feel like the demise of a unique individual, not just the inevitable tying up of a loose plotline. After all, there were only three ways the twinned Crichton story could end. The two could have somehow been reintegrated, a possibility that was never mentioned in “Eat Me” and became distinctly unlikely after the death of Kaarvok. One could have been driven insane—my money would have been on the Moya Crichton—and turned rogue, leading to an even more implausible rehash of “My Three Crichtons.” Or the show could have done what it strongly implied it was going to do in “Thanks For Sharing,” which is kill one of them off. I’ll admit that “Infinite Possibilities” is not so powerful that it literally gets me to forget about the other Crichton; I wouldn’t be drawing such close connections with a MST3K entry if it did. But that’s not a reasonable expectation, even if this two-parter does studiously avoid any mention of the duplicate. The dying Crichton could well have offered some message for his crewmates to relay to his other self, but his death is his and his alone. But the real genius of “Infinite Possibilities” lies in how strongly it argues that this story represents the death of a unique, even—and I use this word advisedly—irreplaceable version of Crichton, one that we won’t see again when we next check in on Moya. 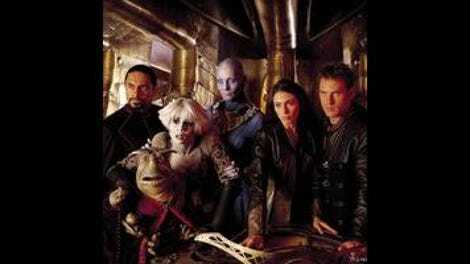 Farscape has been careful to attribute any differences between the two Crichtons to strictly contextual differences. The Talyn Crichton has been the better Crichton because he’s been able to spend the past few months with the love of his life, and he has actually had clear missions with clear goals. Crichton and his Talyn crewmates have had to evade Xhalax Sun’s retrieval squad and help Jack the Ancient in keeping the wormhole technology out of the wrong hands. The Moya version of Crichton has wasted his friends’ time by searching for wormholes, so pissed off Pilot that he got kicked off of the ship, and dicked around with drug dealers on a pleasure planet. The two Crichtons then have been placed in situations that have brought out the best in one and the worst in the other, and that’s before we consider how profoundly the Talyn Crichton is affected by the removal of Harvey. And yet, I’m not actually sure this story would have unfolded any differently, at least not in its Crichton-specific details, if Jack the Ancient had instead appeared on Moya. In particular, I go back to Furlow’s final line: “Don’t be the hero, John. Always be the one to walk away while the hero dies, that’s my motto.” I don’t for a second think that Moya Crichton would have walked away from that deadly radiation—although I suspect he would have been more tempted to than his counterpart, if only because Harvey would have still been in there screaming. The real difference, though, is not one of action but of motivation. The Crichton of “Infinite Possibilities” has reconnected with the man he used to be and discovered the promise of a better life tomorrow. In Jack the Ancient, he sees a facsimile of all that is worthy and true about his past; with Aeryn, he sees hope for the future. Harvey, more than anything, kept him anchored to the endless, hellish present, inflicting psychic pain so constant and so profound that it can only be truly appreciated once removed. What separates the Crichton of “Infinite Possibilities” from the man on Moya, from the man we’ve known since “The Hidden Memory,” is that he finally, genuinely has found something worth living for, and by extension he has found something worth dying for. The other Crichton would have risked the radiation and fired the weapon. But he would have done so because his life is cheap, or because this action might have redeemed all his past mistakes; his reasons would have been born of the deep-seated self-loathing that the Talyn Crichton was finally able to escape with the death of the neural clone. But this story isn’t just about Crichton; so many of the most important emotional beats belong to Aeryn Sun. It is she who, believing John to have been subsumed by the neural clone, does not hesitate to put a gun on his head in “Daedalus Demands,” but she does hesitate to pull the trigger in “Icarus Abides,” much to Harvey’s frustration. It is she who rallies Rygel, of all people, to risk his life defending the workshop against the Charrid onslaught. It is she who takes the time during the climactic dune buggy chase to mock Crichton’s endless bad luck and incompetence one last time, then tell him that she loves him. It is she who angrily demands why John must sacrifice himself, then even more angrily demands why she cannot go instead. It is she who has to watch her beloved die an agonizing death. Most crucially, it is she who finally sets aside whatever lingering doubts she might have had and agrees to return to Earth with John. What has so long been positioned as a foolish, even selfish dream of Crichton’s now transmutes into an actual plan, one that both are legitimately excited about. It’s so wonderfully Aeryn Sun that, when she finally does make the biggest commitment possible, her statement is so completely matter of fact: “Let’s do what we have to do here and then we’ll go.” It’s that line as much as any that makes the death of Crichton at the end of “Infinite Possibilities” feel real; that promise is confirmation of how far their relationship has progressed since “Thanks For Sharing,” and there’s absolutely zero guarantee that she could reach the same place all over again with the other man. Way back in “Premiere,” the real Jack Crichton made a promise to his son: “Each man gets his chance to be his own kind of hero. Your time will come and when it does, watch out. Chances are it’ll be the last thing you ever expected.” The truth of that statement has been already been realized dozens of times over, and even more spectacularly not realized on at least a handful of other occasions. But “Infinite Possibilities” does feel different, because this is the story where we finally learn what Crichton is capable of when survival is no longer an option. When he opens up the wormhole and uses the displacement engine to fire part of a star at the Scarran dreadnought, he does so not out of hate or fear, but out of—sure, I’ll say it—love. Love for Aeryn Sun, certainly, love for his shipmates—yes, even Crais, though don’t ask John to admit that—love for this crazy corner of the galaxy he has come to know these last several cycles, love for all that he ever left behind and for all that he now will never know. He’s just Mama Crichton’s baby boy, making wormholes. That’s all he ever needed to be. After two years of torment, he dies a free man, having finally shaken off Harvey and having finally found—to borrow his exhortation to Crais—the better part of himself. Looking ahead, perhaps the most enduring tragedy of “Infinite Possibilites” is just how far the surviving Crichton is from being able to say the same. But that can wait for another day. Goodbye, John. Sleep well. It’s interesting that Crichton makes peace with Crais and Rygel and has some quite beautiful last words for Aeryn, but he doesn’t really have anything to say to Stark, at least not anything we see on-screen. I’d imagine that he says something before we actually join them in that particular scene, but it’s a subtle reminder that Stark is still the outcast within a group of outcasts. His continued creepiness to Aeryn in “Daedalus Demands” also does not go unnoted. The death of Harvey—this version of him, at least, since the neural clone was twinned as well—is well handled, and it’s a neat detail to put John back in his original IASA flight suit for his scenes with him, another hint that the show is truly revisiting his origins. (Speaking of which, why precisely did Furlow paint the IASA logo on her copy of the module? One assumes the practical reason is that they were just reusing the regular module prop, but I suppose the in-universe reason is that she’s even more infatuated with Crichton than we thought.) The trip to the amusement park is a suitably bonkers way to depict the final battle between the two characters, and “Infinite Possibilities” rather niftily manages to have its cake and eat it too with the fake-out that Harvey triumphed.